A stunning mix of colours from purple to white, known as Snakeshead due to its unusual markings. Their beautiful Checkerboard flowers are easy to grow and perfect for shady borders or under trees. Their dainty nodding flowers will appear in April, and last several weeks. Plant in groups in grass, or under trees, for a gorgeous natural look. Very easy to care for. Slow growing, so will not take over. Ht 20cm or so. Pack of 75 bulbs. 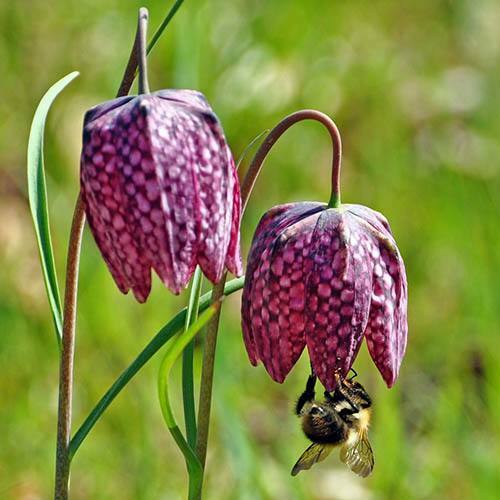 A stunning mix of colours from purple to white, fritillaria meleagris is also known as Snakeshead due to its unusual markings. With their beautiful checkerboard flowers, these hardy, easy to grow wild flowers are perfect for shady borders or under trees. Their dainty nodding flowers will appear in April, and last several weeks. Plant in groups in grass, or under trees, for a gorgeous natural look. Very easy to care for. Slow growing, so will not take over. Ht 20cm or so. Supplied as a pack of 75 bulbs, ready for planting. Size: 5/6.